Sapelo Island is by far the most fascinating and unique place that I have visited while painting the lighthouses for this book. The eighty foot tall tower with its red and white stripes is a handsome sight as it sets in the midst of the tall cordgrass that extends out into the lush tidal salt marshes. 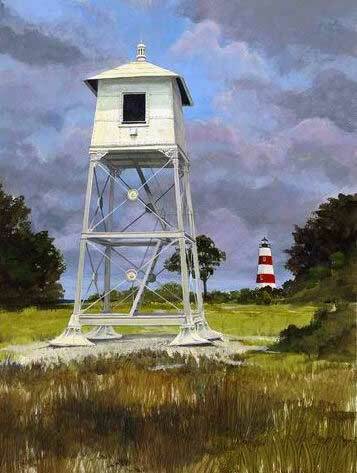 There have been two lighthouses at Sapelo Island. The lighthouse that is standing now was built in 1820 but a hurricane and tidal rise in 1898 left the lower part of the lighthouse eighteen feet underwater for several hours. It so severely undermined and damaging the foundation of the brick tower that it was deemed unsafe and a second Sapelo Island lighthouse was built in 1905 to replace it just a few hundred yards away. Called a skeletal lighthouse, it was made of cast iron, similar to the one at Sanibel Island in Florida. It had a cast iron tube running up the center to the lantern room and was supported by iron legs that ran from the top outward to the bottom. It was deactivated in 1933 just twenty-eight years after it had been built when shipping into the Darien area declined so much that there was no longer a need for it. Today the port at Darien is home only to shrimp boats. The lighthouse was dismantled piece by piece and moved to South Fox Island on Lake Michigan where it stands today. Only the concrete supports for the base remain at the site along with oil house and the collapsed dock that once serviced the lighthouse. The two keepers houses that once stood on each side of the light were also taken down at the same time the lighthouse was dismantled and the lumber sold as scrap on the mainland. The first Sapelo Island lighthouse remained intact but stood there damaged and in disrepair when in 1998, one hundred years after the devastating hurricane put it out of commission, the foundation was once again made stable and a beautiful restoration on the lighthouse was completed inside and out. The old cypress spiral staircase that had rotted away and fallen in were replaced with new ones made of Georgia pine. It was a major job as each step is slightly different than the next. That part of the job and dealing with the many snakes that had made the lighthouse their home between the interior and exterior bricks for so many years took several months to complete. A modern beacon at the top now makes this lighthouse a working aid to navigation once again but since the port at Darien hasn’t grown, the restoration primarily serves the historic values of the community rather than the port. There is another Sapelo Island lighthouse that sits near the brick tower, a third so to speak, but it differs in that it serves as a front range beacon. When lined up with another similar one down river, it guided ships on a straight path through the Doboy Sound up to Darian. Since channels sometimes shift and change over time, the cast iron beacon was built in several sections so it could be dismantled and moved to another site to compensate for any changes in the channel and still guide ships on a straight path. It never was moved however, and the beacon sits where it always has, just one hundred yards from the Sapelo Island lighthouse. Originally built in 1877, the beacon has been fully restored. The rear range beacon across the channel no longer exists.